Tannoy denies it will end all speaker production in Scotland | What Hi-Fi? Parent company Music Group says union suggestions that it has reneged on plans to keep some speaker production in Scotland are "incorrect". The controversy over the future of Tannoy speaker manufacturing in Scotland shows no signs of abating. A report in The Scotsman says Music Group has "failed to honour its commitment to relocate to a new site in Scotland", according to the GMB Scotland trade union. But Bjorg Agustsdottir, public relations specialist for Tannoy's parent company Music Group - based in the Philippines - has told What Hi-Fi? today: "The statement from the union is incorrect - nothing has changed in our plans to keep the production of our high-end speakers in Scotland. In fact, at the upcoming CES [in Las Vegas], we will be showcasing exciting new speakers which will be produced in Scotland." However, GMB Scotland says senior managers at Tannoy's Scottish plant in Coatbridge have been put on "gardening leave" and had their emails blocked, while workers have been urged to sign individual redundancy deals by 13th January, ahead of the plant's proposed closure in March 2017. Ude Adigwe, GMB Scotland organiser, told The Scotsman: "Uli Behringer [chairman of Music Group] is leading his workers and the media up the garden path over his real intentions for Tannoy's Scottish operations. “With local management having been effectively routed by Behringer, it looks like the Coatbridge plant is simply being run down ahead of March with no real prospect of a new site." Tannoy Prestige speakers: still to be made in Scotland? Tannoy celebrated its 90th anniversary in 2016, but celebrations have been overshadowed by the threat of 70 job losses in Coatbridge. Back in May 2016, when asked about the legendary Tannoy Prestige range, a big part of whose appeal with customers is the fact that it is made in Scotland, a spokeswoman for Music Group told What Hi-Fi? : "Uli Behringer is planning to keep manufacturing of the Prestige range in Europe, although not necessarily in the UK." When subsequently contacted by What Hi-Fi?, Uli Behringer told us: "Tannoy Scotland is losing substantial money, a situation that is simply not sustainable and hence the steps we had to undertake. But we will be massively investing in Tannoy, and especially our large R&D centre in Manchester." There has been some confusion since then, with the bulk of manufacturing expected to be transferred to a new $100m factory in China but uncertainty as to where, exactly, the Prestige range will be made. Richard Leonard, MSP, Scottish Labour's economy spokesman, has told The Scotsman that he has raised concerns about the future of Tannoy in Scotland in the Scottish Parliament and with Scottish Enterprise, and he has called for the Scottish Government to intervene. 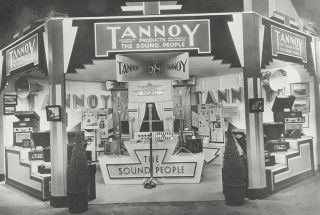 We hope to find out more about the future of Tannoy when we meet Music Group representatives at CES next month.